They came out of nowhere, five men on horseback, their pistols at the ready. The drivers of the stagecoach and the two accompanying freight wagons were not of a mind to resist. The date was January 15, 1874. The stagecoach passengers had departed the train at Malvern, Arkansas and boarded the coach for a twenty-five mile ride to Hot Springs. Mainly they were affluent people intending to spend a winter vacation enjoying the hot mineral water bathes and luxurious accommodations the town was famous for. They were rowed up beside the coach and systematically relieved of their money, watches, and jewelry by the polite but demanding highwaymen. The James-Younger gang took a little over two thousand dollars from that robbery. They were Jesse and Frank James, Arthur McCoy and two others. Later it was determined that the unidentified men were probably James and John Younger. The gang disappeared and efforts to find them turned up no clues. We now know they headed north. Twelve days later they showed up at Chalk Bluff, Arkansas near the Arkansas/Missouri border. They probably had holed up in nearby Greene County. The former Confederate guerillas would have found many friends in Greene County. At Chalk Bluff they had the local blacksmith re-shoe their horses. He wisely asked no questions. They paid him for his services and went on their way. Back in July the gang robbed a train in Iowa, but their money was running low and somewhere along the way they devised a plan to rob a train in Missouri. This was to be their first train robbery in Missouri. They determined Gads Hill would be a good location to hit. The village consisted of few houses, a store, a railroad loading platform, and siding switch. Trains were sometimes switched off to pick up loads of logs or lumber or passengers. Gads Hill was about ten miles north of Piedmont. While the robbed train was going south to Piedmont to report the hold up, the robbers would travel north lengthening the distance between them and any pursuers. Then they would turn northwest into some of the roughest terrain in Missouri. They followed a route from Arkansas into Missouri that many a Confederate raiding party had used a scant decade before. Much of the area was yet swampland. They entered Missouri near Chalk Bluff and traveled the high ground between the Black River and the St. Francis River. They probably tarried just long enough to find two more local men to obtain the train schedules and act as guides and lookouts. The area and the people had been savaged terribly by Federal troops. To the west of the Current River a former Federal militia officer, the nefarious Colonel Billy Monks, still held control over Howell and adjoining counties, forcing former Confederate sympathizers to leave or face destruction and death by night riders. To the east in Stoddard County, night riders were active also. Along Crowleys Ridge several murders had occurred. In short the war, for some, had not ended in 1865. In 1874 the local newspaper often had whole pages of abandoned or repossessed property listed for Sheriff’s sale. It would not be difficult for the gang to find a couple of helpers. About three o’clock in the afternoon on January 31st, 1874, seven masked well-armed men rode into the village of Gads Hill. The store owner was robbed and the rest of the village inhabitants were rounded up. Some accounts say they were placed in the store. Some say they were kept around a large bonfire. Others say a small station house was used to detain them. This writer believes that it is more likely they were held under guard in the store. A bonfire would attract unwanted attention and a crowded station house would have looked suspicious. 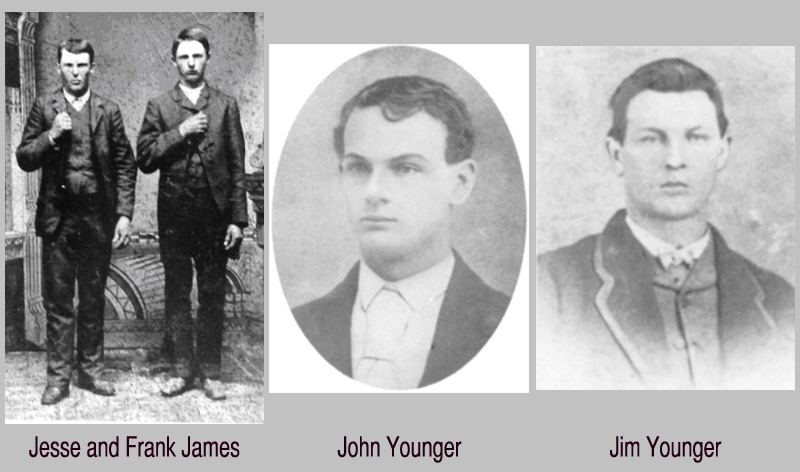 The James-Younger gang was well aware that the railroad owners and the bankers had hired the Pinkerton Detective Agency to capture the gang and put a stop to the robberies. Pinkerton was becoming increasingly frustrated and was said to be riding some trains himself. They fully expected to find a Pinkerton man on this train. 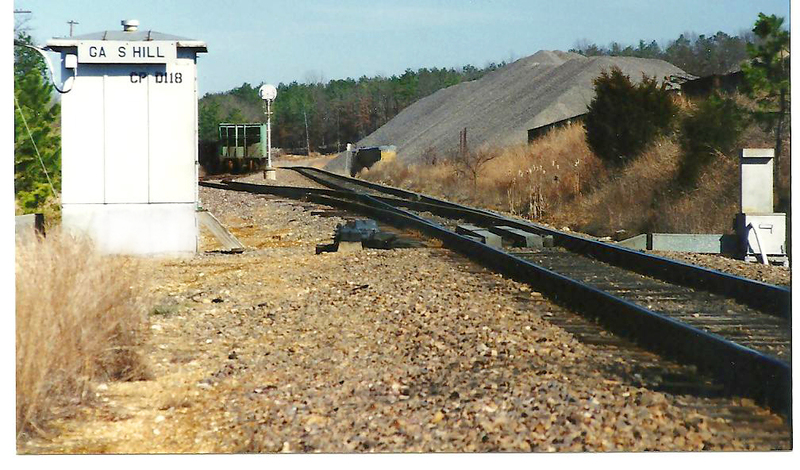 The siding switch was opened and a red flag readied to warn the train to stop or face derailment on the siding. At about four-thirty in the afternoon the southbound St. Louis to Little Rock passenger train braked to a stop even though the man waving the red flag wore a mask. The conductor stepped off the train and was promptly relieved of his money and valuables. Four other outlaws appeared and boarded the train. They announced that they were there to rob the rich and would not take money from working men and the ladies. They checked the hands of the men for calluses and those with soft hands were promptly robbed. Those with fancy clothes and hats were given special attention. When one lady was found to have four hundred dollars in her purse they reneged on their promise to rob men only and took her money. They asked the male passengers their names and place of residence, checking them closely. They were looking for a Pinkerton detective. In the express car they broke open the safe with a sledge hammer and proceeded to take anything of value from it. The gang collected at least two thousand dollars. Some sources put the amount taken at five thousand. Satisfied they had found all the money they could, the robbers called in their lookout, and released the train to go on to Piedmont. They stole three more horses from the residents to use as spare mounts. The seven robbers then mounted their horses and rode west into the night. Once out of sight the two mystery men rode in a different direction and faded into the landscape. The remaining five turned right and proceeded to the West Fork of the Black River, carefully concealing their trail. It was reported later that five mysterious riders were spotted near Lesterville about daylight the next morning. This pre-1900 railroad map of the Iron Mountain & Southern RR shows the Gads Hill location (left side of the large R). The James/Younger gang passed through Chalk Bluff Arkansas located at the extreme upper right corner of Arkansas (not on modern maps). The most logical route north for them would have been on dry land between the Black River on the left and the St. Francis River on the right. The 1870 census indicates my great, great grandparents were living near Altha, Stoddard County. This is the only map that I have found that shows Altha. A large posse left Piedmont the next morning after the robbery and picked up tracks near Lesterville. A light snow had fallen that night and aided the pursuers’ efforts. One of three horses stolen at Gads Hill was found and identified. It was in jaded condition. In the breaks of the upper Current River the gang found a farm that offered food and an overnight rest stop which they paid for. The next morning they stole a fresh horse from their host and were on their way. The next report of strange riders came from near Phillipsburg. Then as time went on, suspicious looking men were seen at Boliver on the west side of the state. The Piedmont posse had stopped for rest at Licking and then gave up the chase. One gets the idea they may not have been too eager to have caught up with the desperadoes. Each of the five robbers openly carried four pistols and in addition several carried shotguns as well. A rifle and ammunition had been taken from the Gads Hill store. The posse gave it a good try. Perhaps after the first adrenalin rush some may have began to wonder just how much they owed the railroad magnates. In those days it was customary for travelers to stop at farms for meals and lodging. They paid for the services much as we do at bed and breakfast accommodations today. The extra money was welcomed as well as a chance to catch up on current events. When the James-Younger gang took a horse it was almost always reported as stolen. Before we leave the subject of the stolen horses, let us stop and think a moment. While the fields were plowed and worked by mules or oxen, a horse was a valuable transportation and light draft animal as well as essential in producing mules. The James-Younger gang was certainly foolish to take up a life of crime. They were not fools when it came to the value of the animals. Most likely they paid for the horses they “stole”. The farmer may not have been given a chance to say no but a generous payment bought his cooperation, as well as a poor memory and dim recollection of the direction taken by the unknown strangers. Jesse and Frank James eventually made it back to their home area around Kearney, Missouri. James and John Younger were in St Clair County by March. We will discuss brothers James and John in a later blog. I was privileged to live for twelve years in southeast Missouri. I worked for Black River Electric Cooperative headquartered in Fredericktown with branch offices at Ellington and Marble Hill. My work took me by Gads Hill many times. I was already aware of the 1874 train robbery before I moved to the area, so I took note of Gads Hill when I passed by. There was not much there. A bar (closed I think) and a farmhouse or two down the road. I remember a huge aggregate pile and rock crusher. The railroad had been cut deeper into the south slope of the mountain than it probably was in 1874. Highway 49 took us southward down into the beautiful Piedmont Valley and to Clearwater Lake. My great, great grandparents lived in Stoddard County during the 1870’s, a fact that was unknown to me at the time I lived in southeast Missouri. I became aware of that only in recent years. In my quest for more information I searched county newspaper files and legal records for information on my ancestors. I learned a great deal about Stoddard County at the state archives in Jefferson City. Much violence went on there during and after the war of the rebellion. The newspapers seldom reported it, choosing to report the violence and turmoil in other states. In fact the newspaper in Stoddard County extolled the virtues of the county continuously. They were trying hard to leave the sorrows of war behind. And they do have one of the best farming communities and best places to live in the country. I visited the county a few years ago searching for my roots. While there I met nice and helpful people. My Irish immigrant great, great, grandfather Michael Ryan was set upon, robbed and murdered by highwaymen on the evening of November 19, 1874. The attack occurred near the southwest corner of the current city of Dexter, probably near the location of the golf course. An inquest was held and the murderer was identified. He was never brought to justice. I have yet to find my ancestors grave. My reason for being in America is there, somewhere in Stoddard County. —Best wishes for the new year. 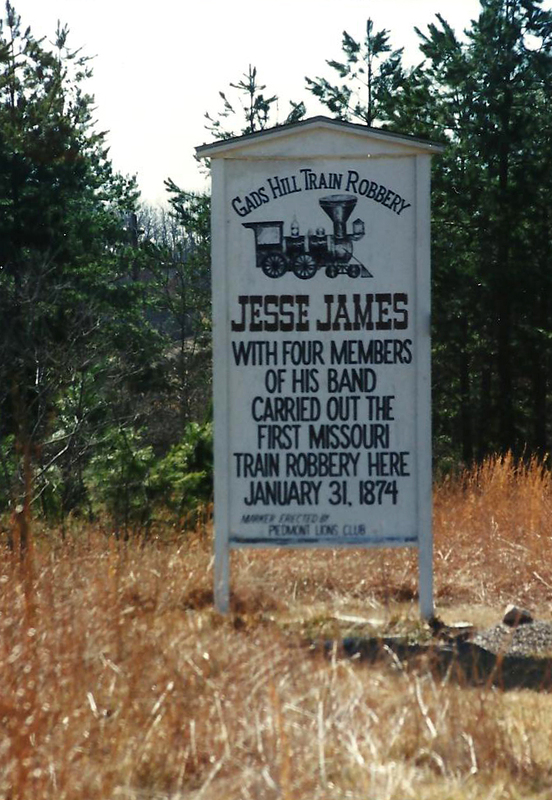 Sign along 49 highway marking the train robbery by the James/Younger gang. 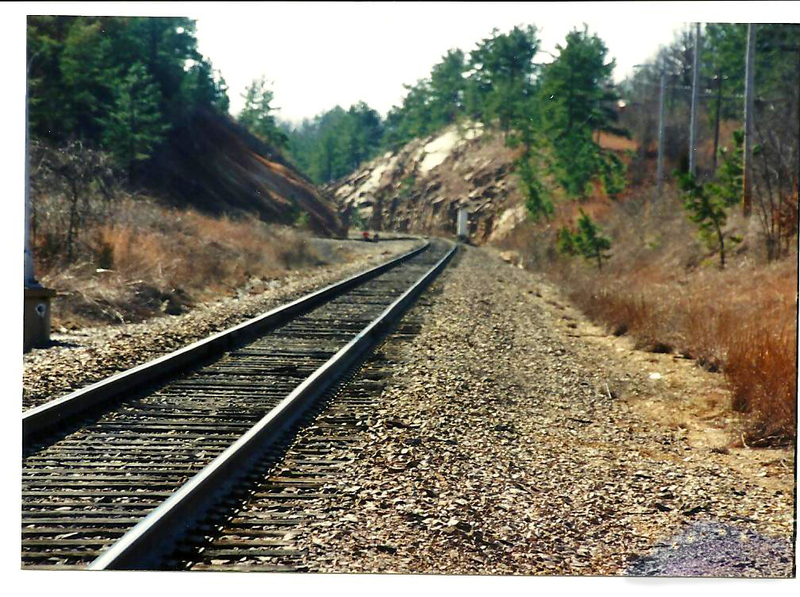 North and south views of the modern day railroad at Gads Hill.